Every once in a while somebody issues a report or a magazine publishes an article telling us we're going to run out of freshwater someday soon if we don't get our act together. And since freshwater is unequally distributed with respect to the unchecked growth of the human population, some countries (or peoples within those countries) will die of thirst before others do. After the new warning becomes available, a few people sound the alarm, and then, with the inevitable turnover of the 24-hour news cycle, everybody moves on to other concerns like farcical political campaigns, trapped Chilean miners, or fraudulent foreclosure notices. Council Leader — There are advanced lifeforms capable of radio astronomy on the planet Earth in the habitable zone of the G-type main sequence star Sol. That's a bit over 12 light years from here. Are they worth checking out? I'd like to hear the conclusions of our special assessment team. Assessment Team Leader — Council Leader, we have concluded that by the time we get there, if we travel at our usual 1/10th of light speed using suspended animation, there won't be many of these self-styled Homo sapiens (meaning in their parlance "wise man", aka. "humans") left to study, or very few at any rate. As you know, our initial probe went out some time ago and has been giving us a steady stream of excellent data from a hidden (and still undetected) location orbiting around the 3rd planet in Sol's solar system. In short, the humans living on this planet refuse to rein in their runaway population growth. They are running short of "fossil fuel" energy resources, which enabled the growth of their advanced civilizations. However, burning those same resources has also resulted in very serious global warming problem due to increased CO2 levels in Earth's atmosphere. They will soon be running very low on freshwater as a result of all this, and as you know, Council Leader, it is freshwater which sustains all advanced eukaryotic life in the Milky Way. In addition, and partly as a result of those considerations already stated, they are destroying in various ways (from predation, acidification, etc.) their precious oceans, which cover 70% of their planet. We predict a mass extinction of life on Earth with a certainty of about 85%, although that's a conservative estimate. Even if some of these humans survive this longer term event, their advanced civilization will be a thing of the past. Our conclusion then is that these humans are a flash in the pan, and will be pretty much gone by the time we get there. Thus, the assessment team voted unanimously against making the effort to make direct contact with this almost certainly doomed species. Alternatively, we could send them an urgent radio transmission saying they better get their act together pronto, or face the consequences. Now that we've set the context, let's look at Newsweek's latest water warning The Race To Buy Up the World's Water — Should private companies control our most precious natural resource? 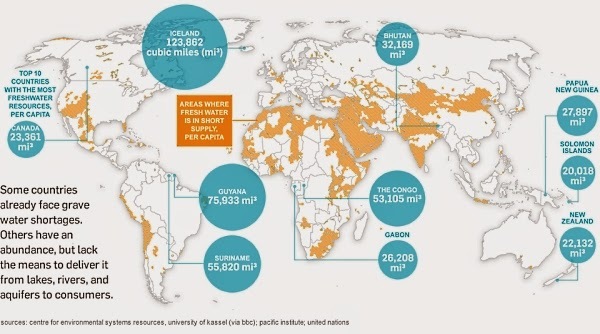 Everyone agrees that we are in the midst of a global freshwater crisis. Around the world, rivers, lakes, and aquifers are dwindling faster than Mother Nature can possibly replenish them; industrial and household chemicals are rapidly polluting what’s left. Meanwhile, global population is ticking skyward. Goldman Sachs estimates that global water consumption is doubling every 20 years, and the United Nations expects demand to outstrip supply by more than 30 percent come 2040. Click on the map to get a better view. The big blue circles represent countries where freshwater is still abundant, meaning that private companies could make a killing selling their water to the people who literally can't live without it in the orange areas . The bottom line is this: that water is essential to life makes it no less expensive to obtain, purify, and deliver, and does nothing to change the fact that as supplies dwindle and demand grows, that expense will only increase. The World Bank has argued that higher prices are a good thing... If water costs more, they say, we will conserve it better. The main problem with this argument is what economists call price inelasticity: no matter what water costs, we still need it to survive. So beyond trimming nonessential uses like lawn maintenance, car washing, and swimming pools, consumers really can’t reduce water consumption in proportion to rate increases. “Free-market theory works great for discretionary consumer purchases,” says Hauter. “But water is not like other commodities—it’s not something people can substitute or choose to forgo.” Dozens of studies have found that even with steep rate hikes, consumers tend to reduce water consumption by only a little, and that even in the worst cases, the crunch is disproportionately shouldered by the poor. Read the entire Newsweek article if you want additional details. And there are plenty of studies on the web about the world's freshwater crisis.